Giving a crocheted affect, the center, vintage button is certainly a focal point for this button barrette. 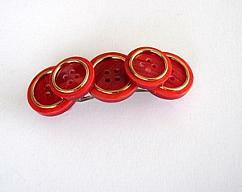 It is a large button, 1 1/4", and is covered in a crochet and fabric design in deep rust. Flanking it are 2 wood heart buttons and 2 small bronze toned pieces.